Maccabi Electra Tel Aviv notified Stephane Lasme that they will not be picking up their option on him for next season. The club wishes the player a speedy recovery and all the best in the future. In accordance with the contract between the parties, the Maccabi Electra Tel Aviv basketball club has informed Stephane Lasme that they will not be exercising their option on him for the upcoming 2010 – 2011 season. Lasme, an excellent athlete and superb defensive player, was an important part of Maccabi’s team last season. 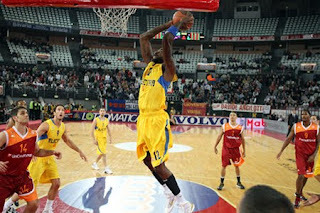 In Euroleague play, he averaged 6.5 points, 4.4 rebounds, and 1.4 blocks in 19 minutes on the court. Near the end of the season he injured his foot and was operated on, and his lack during the Israeli Final Four was deeply felt.Maccabi Electra Tel Aviv wishes him a speedy recovery and all the best in the future. Right thing for Stephane's career is to go back to Partizan. Partizan's fans love him very much, Lasme already knows everything here, people, city, club, fans, Dule Vujosevic system...We'd like to see him again in the holy black-white jersey. Cheers everyone!